Scientists at the University of East Anglia have made an important breakthrough in the quest to generate clean electricity from bacteria. The research shows that it is possible for bacteria to lie directly on the surface of a metal or mineral and transfer electrical charge through their cell membranes. 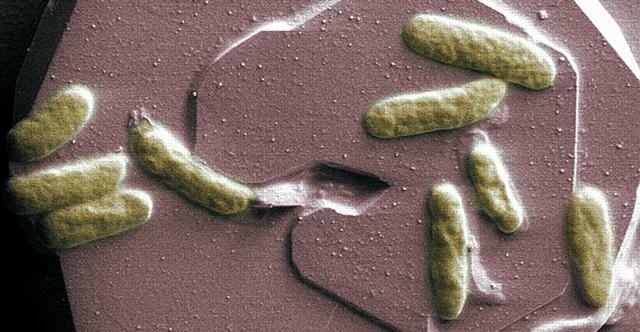 This means that it is possible to ‘tether’ bacteria directly to electrodes – bringing scientists a step closer to creating efficient microbial fuel cells or ‘bio-batteries’. Shewanella oneidensis (pictured) is part of a family of marine bacteria. The research team created a synthetic version of this bacteria using just the proteins thought to shuttle the electrons from the inside of the microbe to the rock. Lead researcher Dr Tom Clarke from UEA’s school of Biological Sciences said: “We knew that bacteria can transfer electricity into metals and minerals, and that the interaction depends on special proteins on the surface of the bacteria. But it was not been clear whether these proteins do this directly or indirectly though an unknown mediator in the environment. “Our research shows that these proteins can directly ‘touch’ the mineral surface and produce an electric current, meaning that is possible for the bacteria to lie on the surface of a metal or mineral and conduct electricity through their cell membranes. “This is the first time that we have been able to actually look at how the components of a bacterial cell membrane are able to interact with different substances, and understand how differences in metal and mineral interactions can occur on the surface of a cell. “These bacteria show great potential as microbial fuel cells, where electricity can be generated from the breakdown of domestic or agricultural waste products.